I have had pets my entire life and love working with animals. I am originally from Maine, but also spent time growing up in Texas. I completed high school and college in San Antonio before graduating from Texas A&M College of Veterinary Medicine in 1999. Shortly after graduation, I moved to Connecticut and started practicing at Norwalk Animal Hospital. I became a partner in 2009. It was around this time that I developed an interest in rehabilitation. I attended a meeting about rehab because I wanted to see how I might be able to help my family’s newly acquired three-legged Yorkie. I was immediately hooked and began looking for more formal training. In the spring of 2009, I started my first course at the Canine Rehabilitation Institute in Florida. I finished my training a year and a half later and became a Certified Canine Rehabilitation Therapist, or CCRT. 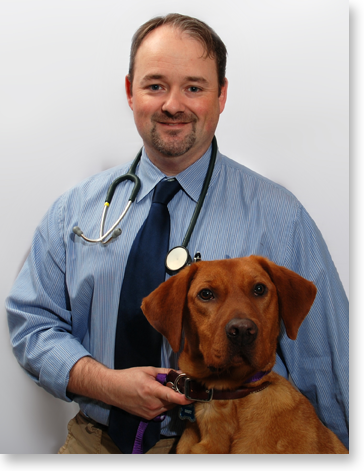 Sound Paws was born in the spring of 2011 with a mission to provide both my general practice patients and referrals with a state of the art rehabilitation facility. My work week is equally divided between general practice and rehab therapy. I enjoy the diversity physical rehabilitation offers and have a special interest and training in neurorehabilitation. There is a certain satisfaction that comes with helping a paralyzed dog regain its ability to walk. Away from work, I enjoy spending time with my family, kayaking, playing ice hockey and riding my Harley. I currently have two dogs, two cats and a tarantula.